As the world warms, floods, droughts, heat waves, wildfires, and storms will increase in frequency and intensity; sea-level rise will accelerate. Unless policymakers implement “substantial and sustained global mitigation and regional adaptation efforts,” climate change will impose “growing loses” on American infrastructure, forestry, agriculture, military installations, recreation, tourism, labor productivity, economic growth, human health, public safety, and biodiversity. Zinke is right about the big picture. The USGCRP modeled climate impacts using four different emission scenarios called representative concentration pathways (RPCs). However, as the report acknowledges, “NCA4 focuses on RCP8.5 as a ‘higher’ scenario, associated with more warming, and RCP4.5 as a ‘lower’ scenario with less warming” (p. 6). So, in nearly every case, the general reader sees a range of impacts that go from bad to worse. Although the report does not describe RCP8.5 as a “baseline” or “no action” scenario, readers are left with the overwhelming impression that the worst impacts are highly probable absent “significant global mitigation action.” But RCP8.5 is not a realistic baseline scenario. It projects higher emission levels in 2100 than about 90 percent of baseline scenarios in the literature. That makes RCP8.5 darn close to being a worst-case scenario. The core defect of RCP8.5 can be stated in two words: natural gas. RCP8.5 derives from an earlier emission scenario called A2 used by the Intergovernmental Panel on Climate Change (IPPC) in its 2007 Fourth Assessment Report (AR4). The analysts who developed A2 did not foresee the coming U.S. shale boom. 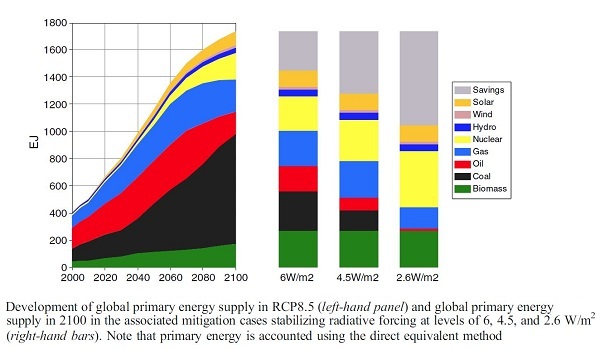 RCP8.5 tacitly assumes that coal becomes the world’s dominant energy source in the 2040s and continues to expand market share relative to gas through the rest of the century. Coal, of course, is the most carbon-intensive fossil fuel, emitting about twice as much carbon dioxide as natural gas per unit of energy consumed. Few experts today expect coal to dominate global energy in the 21st Century. For example, the U.S. Energy Information Administration’s 2018 International Energy Outlook projects global consumption of all fuels to increase through 2040 except coal. The NAC4 authors are undoubtedly aware that RCP8.5 is an overheated scenario. Their justification for using it? “Current trends in annual greenhouse gas emissions, globally, are consistent with RCP8.5” (p. 32). Well, of course, current trends are consistent with RCP8.5, because current trends are consistent with all four RCPs. It is only in the 2030s and 2040s that the RCPs noticeably diverge. More importantly, Michaels also urged the USGCRP to fundamentally change how it models the climate impacts of emission scenarios. Like the IPCC, the USGCRP runs ensembles of numerous models, develops ranges and averages of model-based temperature projections, and infers additional climate change impacts from those projections. Since most models project more warming than actually observed, the assessments typically end up somewhere between dire and catastrophic, especially when the models are run with an inflated emissions baseline like RCP8.5. The grim assessments generate headlines, fuel activism, and put pressure on policymakers to hammer fossil fuels. However, the results are not scientific verities but artifacts of a bizarre methodology. The proper approach is to find models that accurately forecast changes in global temperature, and use only those to inform speculation about other potential climate change impacts. As it happens, only one climate model, the Russian INM-CM4, accurately projects warming in the bulk tropical atmosphere where greenhouse theory predicts the most rapid warming will occur. Since INM-CM4 is the only model that works, it should be the basic model for official climate change assessments. In the chart below, courtesy of University of Alabama Huntsville atmospheric scientist John Christy, the purple line is the INM-CM4 projection. We contributed extensive public comments on the penultimate draft of the latest Assessment, which has changed very little between the review draft and the final copy. The final version contains the same fatal flaws we noted earlier this year. It’s based upon a family of climate models that are predicting far more warming than has been occurring in the all-important tropical atmosphere. It should have used the one model (out of the 102 available runs) that actually gets things right, the Russian INM-CM4, but it relied upon the average warming produced by all 102. INM-CM4 has the least warming of all of them, but doing the right thing—using the one that works—would have pretty much gutted climate change as a serious issue. These reports take several years to produce, and the current one was largely a product of the Obama Administration. If there’s a Trump Administration when the next one is scheduled (2022), it is likely to be very different. Why the current regime just didn’t do as Bush did and simply elide the 1990 law is probably so it will get another crack at it in 2022.